Tomorrow is the first Friday of the month so by now you know that means 3x points on dining with the Chase Sapphire Preferred card. 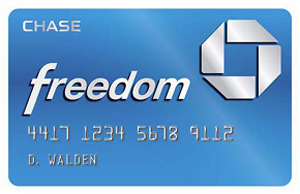 But like I mentioned last month, it’s not the best option this quarter if you want to earn Ultimate Rewards points as the Chase Freedom card will get you 5x points this quarter – provided you’ve registered for the promotion. And for those who prefer cash back, the Discover cards are earning 5% back on dining from April through June. 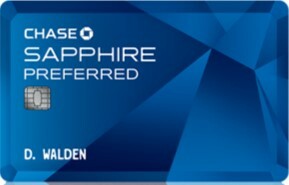 If you only have the Sapphire Preferred, it only makes sense to apply for the Freedom card too. There’s no annual fee so it’s one you can keep forever and as long as you have the Sapphire Preferred or one of the Ink business cards you can pool the Ultimate Rewards points and transfer them to your favorite frequent flyer or hotel program. American Airlines is offering 1000 free AAdvantage miles and an entry in a sweepstakes to earn two first class tickets anywhere they fly. All that is required is that you watch six short videos extolling the virtues of the AAdvantage program. You’ll earn 150 miles for each video and a bonus 100 miles if you view all of them. 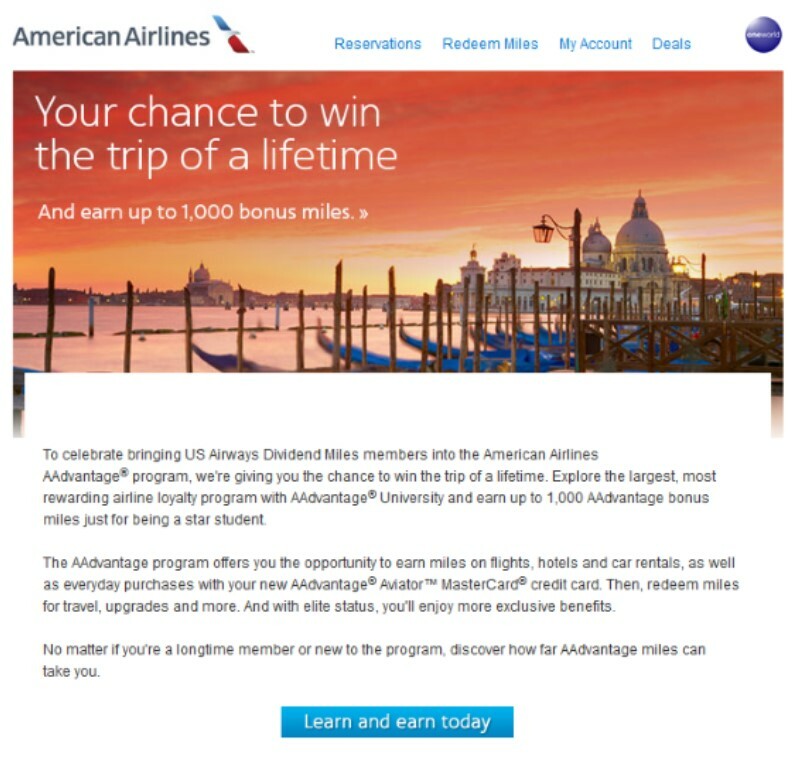 Check your inbox for an email from American, click on the link and start earning miles! Not a Southwest Rapids Reward Member? Sign up now for free! 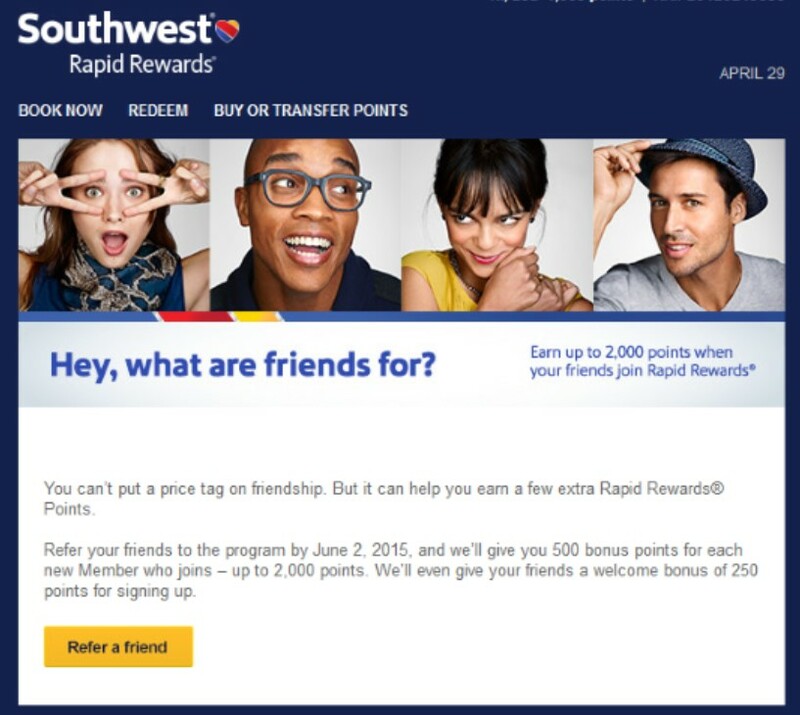 Recently Southwest Airlines sent out an email allowing members to refer others and earn free Rapid Rewards points for doing so. If you allow me to refer you to the program, I’ll get 500 points for doing so and you’ll get 250 points to kick off your account. I can earn up to 2,000 points this way. There is no charge to sign up but do be sure to use the same name as is on your government-issued ID so that there’s no confusion when you fly Southwest and have to go through airport security! If you’d like to sign up, just shoot me an email at 2btraveling@gmail.com and we’ll get you on your way with 250 points. Donations must be received between now and 11:59 pm Central Time on 15 May 2015. 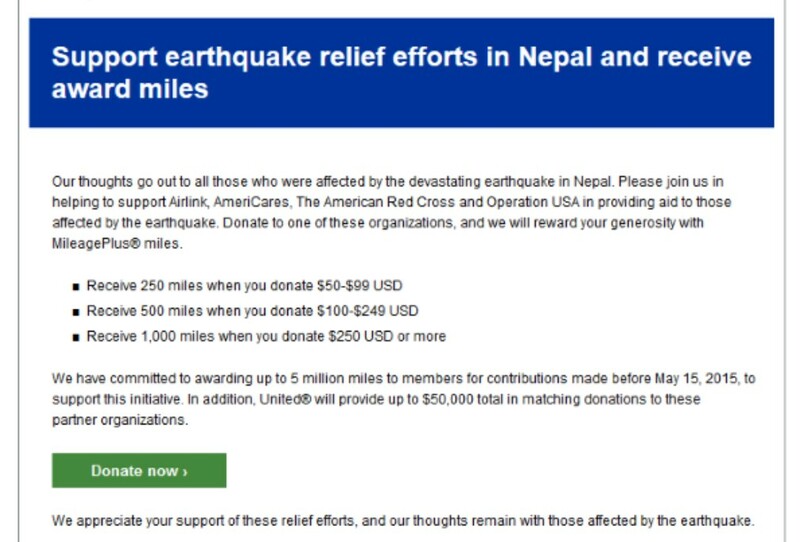 If you haven’t found a way to help out yet, here’s an easy way and you can earn miles in the process. 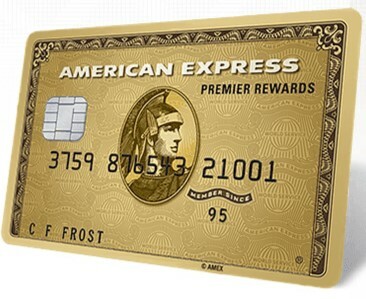 American Express has several cards that earn Membership Rewards (MR) points. These are a great currency that can be transferred to multiple frequent flyer programs at a 1:1 ratio. Those programs include Aeroplan (Air Canada), British Airways Executive Club, Altitalia MilleMiglia and Asia Miles (Cathay Pacific). MRs can also be transferred to the Delta Skymiles and Ethiad Guest programs at a ratio of 1000 MRs to 750 miles. Cardholders will also now have access to a team of travel professionals to assist with travel needs. This can be great for items that points and miles won’t allow you to arrange for yourself. Note that the annual fee is $175 after the first year. These new benefits are nice though I’m disappointed that the 2x points at restaurants is only for US restaurants. If I wanted to take this card overseas that would be a category I’d definitely use but if it’s not going to earn me 2x points I have other cards that will. If you already have this card you’ll see more details on your March 2015 statement. If you don’t have this card, you can apply HERE. Be sure to check the card match tool to see if you can get a better offer. IHG, the company behind Intercontinental Hotels and Holiday Inn, has announced that they’re adding a new top tier loyalty level that will be the next step above Platinum. Platinum has been fantastically easy to achieve because you can “earn” it just by holding the Chase IHG MasterCard, although you can also earn it the hard way, by staying 50 nights or earning 60,000 points via hotel stays. The IHG MasterCard has possibly the lowest annual fee of any status-earning credit card at only $49 per year. Paying the annual fee also entitles the card holder to a free night at any IHG hotel. If you get Platinum status the hard way, the good news is that it’ll be easier to attain, requiring only 40 nights or 40,000 points through hotel stays. The new level requires 75 nights or 75,000 points earned at an IHG hotel. Platinum members get a 50% bonus on points for paid stays while the new level members will get a 100% bonus on points earned. They’ll also receive an annual 25,000 point bonus or they can choose to gift Platinum status to a friend or family member. Another change is that points will now expire after 12 months of inactivity in your account. To get around that you can transfer in points from Ultimate Rewards. As a general rule I’d transfer as few UR points as allowed as URs are much more valuable than IHG points. And on May 1st IHG will be reclassifying some 450 properties, though they claim that less than 300 will be increasing by 5000 – 10,000 points per night while 150 properties will decrease by 5000 points. I typically don’t stay at IHG properties though in the last four months I have stayed at two different hotels. My Platinum status didn’t help at all at a Candlewood Suites but it got me an excellent free breakfast buffet at a Crowne Plaza. The IHG website does state that all stays in 2015 will count towards the new level, so if you often stay at IHG properties, maybe this will be a benefit to you. As long as I still get breakfast and wifi I’ll hang on to the credit card just for the free night. Once any of those benefits goes away I’ll have to re-evaluate. After taking away the best benefit in the world of hotel points, Club Carlson is trying to make nice by offering triple points on stays between now and June 28, 2015. Award stays – whether on points only or by using points + cash – are not eligible. You must register HERE to take advantage of this promotion. The triple point calculation is based on the standard 20 points per dollar spent, not on any bonus points you may earn as an elite member. Additionally, for each reservation made through the Club Carlson mobile app you will receive 1000 bonus points. We boarded through door 2L and I crossed through the galley to the right aisle to settle in seat 3K, which I had selected via a call to Turkish Airlines once the seat selection window opened in June. And it was here that the tale of musical chairs began. One of the great things about Club Carlson is how easy their points are to accrue. The Club Carlson Visa offers 10 points per dollar for purchases at Club Carlson hotels like Radissons, Radisson Blus, Park Inns, and 5 points per dollar everywhere else. The cherry on top of this was that when you have the US Bank Club Carlson Visa and have an award stay of two nights or more, the last night is free. That meant for two people who each had the card, they could make alternating reservations of two nights each and the stay would cost half the points. Per Frequent Miler’s post this morning, this benefit is going away. In its place is an offer for a free night each year after spending $10,000 on the card and paying the annual fee of $75. This is a huge devaluation. I hadn’t even had a chance to take advantage of this benefit and it’s already going away. At the time I made my reservations for our stay at the Radisson Blu Bosphorus, I was not a card member and thus couldn’t take advantage of it. I’m seriously wondering whether or not I should keep this card once the annual fee comes due. Club Carlson is not my go-to hotel chain and their footprint in North America is pretty small. It’s certainly better overseas but my plans for the next few years include places where I expect I’ll be able to find Hyatt, Marriotts and Hiltons. I will definitely have to reconsider keeping this card. Beginning June 1, 2015, you can earn a Free Night, good at any Carlson Rezidor hotel in the U.S. This Free Night will replace the current Bonus Award Night benefit. Bonus Award Night stays may not be booked after June 1, 2015. You’ll receive the new Free Night award upon renewal of your card after an annual spend of $10,000. Updated program terms and conditions will apply and be available on June 1, 2015. Gold Elite Status – which now includes a dining discount at participating hotel restaurants! So spending $10,000 on the card each year will net a free night and at least 50,000 points for that spend. Pay the annual fee of $75 and get 40,000 bonus points. If you were to use the card to load the Target Redcard you could get 90,000 points per year for the annual fee of $75 or $0.000833 per point. Even if you bought Visa gift cards for $10,079, you’d only pay $0.00171 per point. Either way that’s a pretty awesome price for points and a free night to boot. And if you have a stay at a Club Carlson property before the end of August you’ll get an additional 30,000 points. If you can find a room for $90 those 30,000 points will cost $0.003 apiece. Of course, if the cheapest room you can find is more expensive, the points get more expensive too. Ben values these points at 0.4 cents per point while Brian values them at 0.6 cents each. So if you can get the points this cheaply, it may be worth it to you, especially if you have a great use for them.